As we have previously established, “acupressure” refers to any technique using finger pressure on “acu-points” to reduce stress and balance the body energy. An “acupressure” method may be simple and symptomatic, or sophisticated and deeply therapeutic. Jin Shin Do® covers both ends of this spectrum, for it can be used both as a self-help tool and as a professional therapeutic method. It brings about pleasurable, deep relaxation and increased awareness of both body and psyche. Jin Shin Do® contrasts with acupuncture in the absence of needles, and because one individual is touched by another in a highly supportive way which evokes the feeling of being held, cradles and safe. It contrasts with Shiatsu in being a more slow-paced method and focusing more on deep release of muscular armoring. 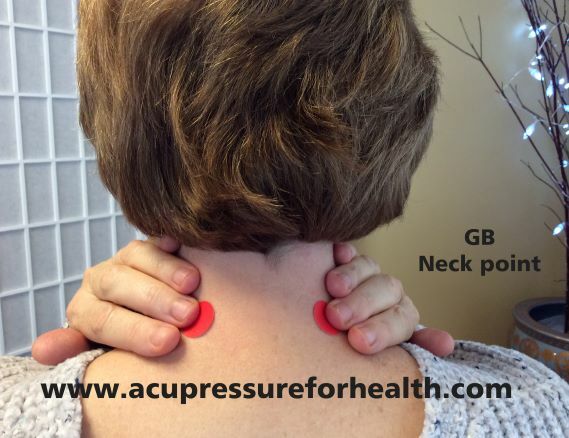 GB neck point: This point is located halfway between the top and the base of the neck and outside the junction of the third and fourth cervical vertebrae about two fingers’ width out from the center of the spine. Do not apply pressure too close to or on the spine. This point helps release the neck, shoulders, and arms and was traditionally used for throat, voice problems and headaches. GB 21: This point is located on the highest point of the shoulder muscle (trapezius) midway between the outer tip of the shoulder and the spine. This point relieves frustration, irritability, fatigue, shoulder tension, and nervousness. TW 15: Feel for a marble of tension in the muscle directly above the top of the shoulder blade. This point helps release the shoulders, neck and arms. It also helps build up the body’s immunity and was traditionally used for hypertension and nervous tension.